Interview with a Little Tutorial and Giveaway! Check out my interview by Heidi Easley. She will be interviewing 21 artists this month so be sure to sign up so you can see the video interviews with little demos and giveaways. Speaking of giveaways, I’m giving away a signed copy of my latest book to one lucky commenter on this post! So be sure to leave a comment and check back on Sunday to see if you are the lucky winner!!! « Registration is OPEN for Life Book 2016!!! How very generous of you to offer your book as a prize. I would love to win because your art is so inspiring! Wow – what an awesome prize! I would really love a copy of your book, Pam, and if I win one, it’d be like an early Christmas present. Thanks for the opportunity! Hi, Pam, I have long admired your faces and also the colors you use in mixed media. I would love to have your book to help me learn how you accomplish this. Thanks. creating from your soul sounds like the only way to live life! such a lovely give away! Signed up for 2016 Life Book. Can’t get enough Carriker. Your book has been at the top of my Christmas wish list for a while now! Drawing faces never gets old. I’m pretty new to mixed media and mixed media artists. Only this month I started faces using the technique for laying out the eyes, nose and mouth, but dont know much in the way of shading. I love how you mixed the paint with the graphite on the paper! Thank you for your information packed interview. The one Pam Carriker book I don’t have! wow! Great interview. I’d picked up a few of your book a while ago, but have not had a chance to open them. I’ll certainly put them on top of my reading stack now, and I appreciate the chance to win this one. Love your work, Pam. Thanks so much. 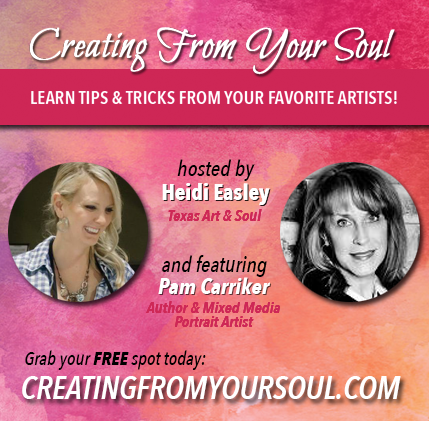 I love what you do Pam, thanks so much for the invitation to the video and the rest of the series of Creating from your Soul. Admire your work and would love to win this book. Loved the interview and can’t wait to try your tip of painting right on top of the graphite pencil…never thought of doing that before! Thanks! Can’t wait to watch the whole video! I really enjoyed your interview with Heidi Easley today, and I especially liked your comment about (paraphrasing here) what to do if the portrait you have drawn does not turn out like you wanted it to: “…just turn the page and make a new one.” Now I think I’ll go take a selfie of my ear and start practicing drawing ears! Your book looks amazing. I would love to see your interview and the tutorial, but I must be doing something wrong. I signed up on the Creating From Your Soul site using the link in your post and it is saying I am registered, but I don’t know how to gain access so I can watch your interview. Maybe I will figure it out soon…. Your interview with Heidi Easley was so inspirational. I would love a copy of your book so I can have a jumping off place to start drawing portraits without being scared. this is wonderful…a new book! love it! Aloha! I so enjoy Art at the Speed of Life… I pick it up for inspiration often. Pam, I have all your books and they are the most dog-eared on my art book shelf. 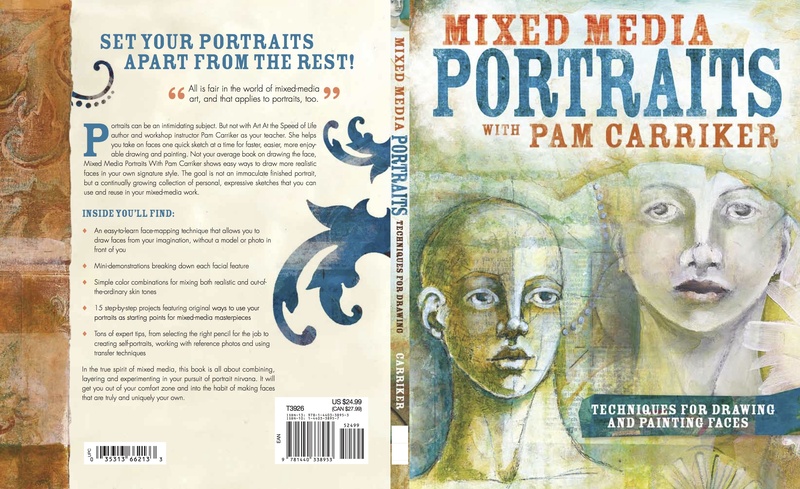 RE: Your Mixed Media Portraits – this book single-handedly helped me peel off the “I can’t draw faces” stubbornness that persisted for decades. The very first time I opened my book (I was an early purchaser! ), I drew a face that even impressed myself. I’m now incorporating them into nearly all of my artwork. Art at the Speed of Life: successfully launched me into my very first art journal. I love to go back and look at my early artwork – it never feels amateurish, just true. Thank you for sharing all you have with us. My friend has your book and says it’s the best for learning to create portraits. I don’t have it, but love your article in the Cloth, Paper, Scizzors special mag – “Faces” ! I loved your interview with Heidi and your comments inspire me to jump in and try new things. I especially like your suggestion for building a pallet of colours. I would be thrilled to win your book. Your portraits are beautiful. It is amazing what you can do with charcoal and white paint. Love your style — hope I’m the lucky winner of your book – would help me so much. Thanks, Pam, for the interview with Heidi today. I am working through your first book right now, Art at the Speed of Life, and appreciate all the tips for squeezing art into a busy life AND keeping the art chaos organized! Love your work! Thank you so much for sharing with us! I am interested in getting back into drawing and exploring portraits. I love your work! I’ve been following Heidi’s daily interviews and am enjoying each one of them. Loved your interview today and am dying to try out your techniques! Thank you for sharing! The interview was awesome. I love to watch you do your process in your portraits. Actually getting to hear more about how you do it is wonderful. Thank you so much for doing this. I would love to win this and to have your signature would add so much. I signed up for your newsletter so can’t wait to get my first one. I did DLP and loved your class. Love the interview. Thank you. And very excited trying graphite and white paint technique! Your work is so inspiring. I would love a copy of your book to reference. Thanks so much for sharing your technique with us. The interview has given me inspiration to try painting some portraits. Thanks for the opportunity to win. I really enjoyed your interview. Great advice! I really appreciate and look forward to all of your posts. Thank you. I really like your art and enjoyed the interview. New at doing people, but so want to learn and get better. Know it’s possible, with practice. Enjoyed your interview today. I have already signed up for LifeBook 2016 and look forward to your session. Would love to win a copy of your new book. Thanks. I just started sketching portraits and your book would be a great addition to my library. I still struggle with faces, but your interview made me want to keep going and see where this could lead me. I really enjoyed your interview with Heidi today, I would love to own a copy of your book. Thank you for your generous give away! My interest in sketching faces is intense. I’d love to win this book and learn your technique. Enjoyed your interview. Thank you! I would love to own and use this book! So cool, thanks for the chance to win!! I love watching you work!!! You inspire me, would love your book! It would be wonderful to win your book! Looking forward to watching the tutorial and listening to the interview. All the best, Pam! Your interview was fascinating! I love how you put a piece of yourself ion many of your portraits. I have always wanted to be able to draw or paint faces, but over the years, I have just left the faces blank, as I never liked how they turned out. Your book would be a great help for me! Thank you! What a wonderful opportunity! You are an amazing teacher and I’m always thrilled to learn from your depth of knowledge. You are so gracious to share your journey with us. Thanks for a chance to win this new gem you have created. I would love to win a copy of your book. Portrait drawing is a scary one for me so this would be the kickstart I need to get over it! This would be a wonderful prize to win. Your art is beautiful. Lovely interview today with Heidi! Really enjoyed your tip in using the woodless charcoal and just blending with the white paint…great way to travel with less art supplies and still create beautiful journal pages…minimalism at its best! You are a wonderful teacher and I would be thrilled to win your book. Hi, Pam! I so thoroughly enjoyed this interview! Watching the graphite and paint process was especially intriguing…hope to win! Thank you. Love your portrait series! Great job! I love your book so much! I’d love to win a copy to give as a Christmas gift for my Mom. Excellent Interview with Heidi. Your talk about portraits made so much sense; but, the greatest piece of advice was to embrace my own uniqueness in drawing faces. I have so much trouble with noses and instead of practicing I just give up. I am going to follow your advice. It would be so awesome to win your book. I am definitely going to try some of your paints. Thanks so much for sharing. So excited to learn from so many artists. I eat drink and sleep this stuff. Thanks so much. I would be thrilled to win your book. My fingers are crossed. Just saw the video of Heidi with Julie Fei-Fan Balzer! Didn’t realize she was interviewing 21 different artists! What fun! Off to watch your video! Hi Pam! Loved your interview and your arty tips. Thank you so much for sharing them with us. I’ve always been fascinated with your art and it’s true what you said about embracing what we create, as it’s our style shining through. Pam, I loved the interview and am so grateful to Heidi for introducing the wonderful artists I wouldn’t have “met” without her! It was very meaningful to me that your portraits come from within; you give them life through your art and it’s amazing! I Would love to win your book because I think it would help me immensely to draw and paint portraits. Hi! I love your creative work and I would love to win your book. It’s so complete and inspiring. So I hope to win. I would love to win your book. I love your work and own two of your other books. This books looks amazingly! I love your work. Im always trying to improve faces in my drawings. What a great chance to win … I would be happy over the moon about it! I love your portraits! They are beautiful and mysterious! I would love to win your book! That weird word should be “examples” of course. Another Internet word snarl. If I won this book, I would gift it to someone else and say that it is an excellent guide, with well thought out methods and a host of exam,es to support the methods. I just bought it, Pam, and it will be some time before I absorb all that you have taught within the covers. This is one purchase I am very happy to have made. Your skills are remarkable. I particularly like the ethereal nature of your portraiture.. Magnificent detail, all so light and airy looking!! Namaste! Would love to win your book. Struggle with my confidence in drawing faces. This book would be perfect for teaching. Hope I win. Thanks so much for the tutorials. Love your artwork Pam; would love to win.